ELDA is proud owner of one more Certificate and this one is extremely valuable for our company development. 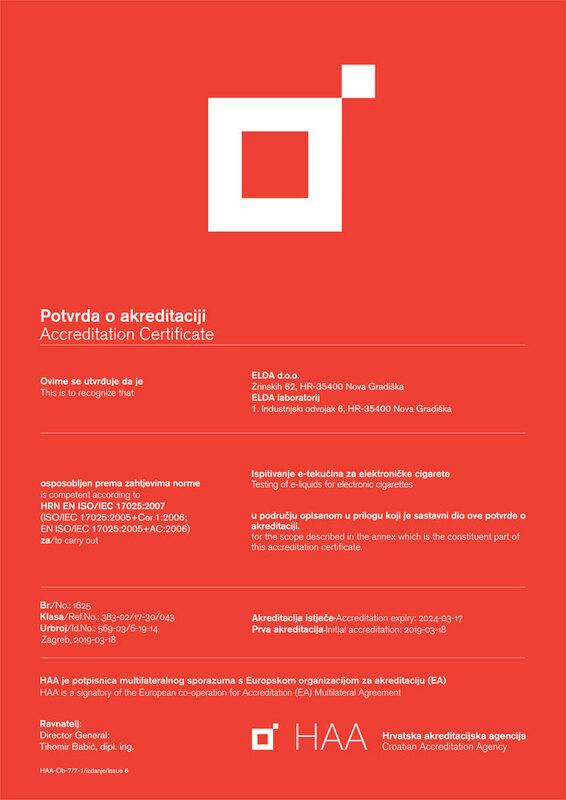 This Accreditation Certificate is given to recognize that Elda Laboratory is competent according to HRN EN ISO/IEC 17025;2007 to carry out testing of nicotine in e-liquids and aerosols for electronic cigarettes which makes Elda's lab first of this kind with this Accreditation. With this Certificate, Elda's lab competency, authority and credibility are recognized and valued, and it opens the possibility for the laboratory to be confident to test and certify samples of third parties e-liquids. We are looking forward to many successful testings in our Laboratory in the future.